Save time and energy while fishing and use a leader line with lures and hooks. Using a leader for fishing has many benefits. A leader lets you use a swivel to quickly change hooks, baits and lures without cutting your line. 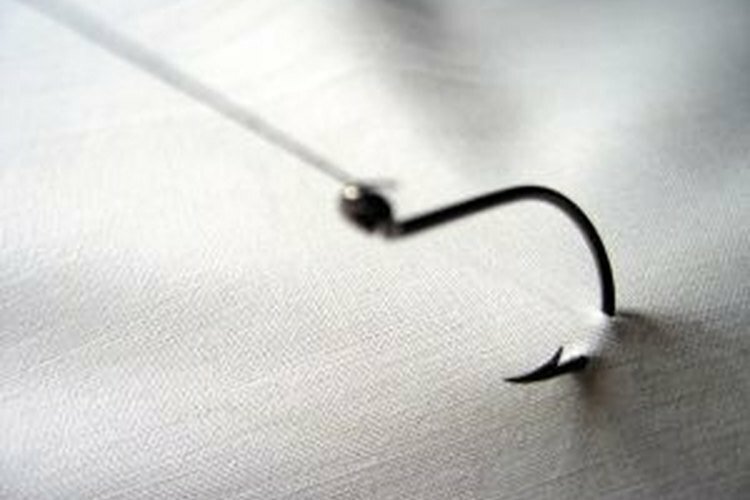 A steel leader also prevents fish with sharp teeth from turning on the line and cutting it as you're reeling them in. Tie a swivel to the line. Using a Rapala Knot, tie a fishing swivel to the end of the braided line. To tie a Rapala Knot, make a regular knot in the line, leaving about 8 inches of free line at the end. Don't tighten the knot until later, as you want the loop to remain open until the end. Pass the free end of the line through the eye of the swivel and then back through the loop of the knot. Wrap the free end around the line on the opposite side of the knot three or four times, pass it back through the open loop of the knot, and then back through the loop created after you wrapped it around the line. Pull the entire knot tight and clip the end. Open the swivel. A swivel opens in much the same way a safety pin does. Simply squeeze the sides of the swivel until the wire pops out of the small metal holder. Attach the leader to the swivel. Slide the top loop of the leader on to the open prong of the swivel. The top of the leader should have a simple loop, and at the bottom should be a swivel. Close the swivel. Squeeze the sides of the swivel and push the open prong back behind the little metal holder, much in the same way you would close a safety pin. Attach fishing gear, such as lures or hooks to the swivel at the bottom of the leader. Sinkers can be attached either above the top swivel, to the top swivel itself, or to the swivel at the bottom of the leader. Use the swivel tied to the braid fishing line to attach any type of fishing gear, including hook leaders, steel leaders and lures. Slide two leaders on to the swivel to fish with two hooks without re-tying your line. Swivels, leaders and knots are more visible than straight line, and although versatile and time saving, may not be the best choice when fishing in very clear water.